Why did you recommend a Kymeta solution for this yacht? The captain of Il sole, a 44.6m Benetti, was an existing client who approached E Yachts for advice on a new antenna solution. 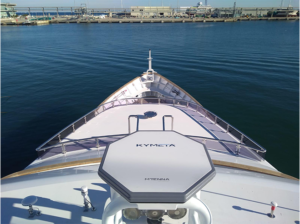 We discussed the varying needs of the yacht over the season and we recommended the Kymeta panel as a cutting-edge option that would easily deliver the bandwidth needed in the Med. Having worked closely with e3, I had thoroughly researched the Kymeta flat panel concept and spoken with their engineering team. I could also see that is was performing well for other yachts cruising in the Mediterranean – which was reassuring for the client. Our decision to opt for a Kymeta panel was based on proven performance and innovation. For our needs it was decided that a one panel configuration was sufficient and that it should be installed on the wheelhouse roof where there would be no issue with shadows. This was our first Kymeta installation, so e3 engineers were on hand to support us with the installation and then to commission the panel. We also used one of e3’s custom-made mounting solutions. Transportation and delivery of the hardware was seamless, with the installation carried out in Port Denia without any need for a crane. Fitting was extremely quick and cost-effective in comparison to a traditional dish. The commissioning was successfully realised with the auto-commissioning process completed in just 40 minutes. What support has e3 provided you with throughout the project? e3 have been a great partner to work with and I look forward to building on this relationship. Initially they helped with all relevant information to support the sale and provided technical support throughout to our engineering team. All hardware was delivered on time and e3 engineers were on board as arranged to commission the panels once installed. We also know we can call on e3 for help, with an engineer always on-hand to speak to. What will Il Sole use the panels for? The single panel will be used to meet all the yacht’s bandwidth needs when sailing out of the range of 4G. It will be sufficient for owner, crew and for guests when under charter. 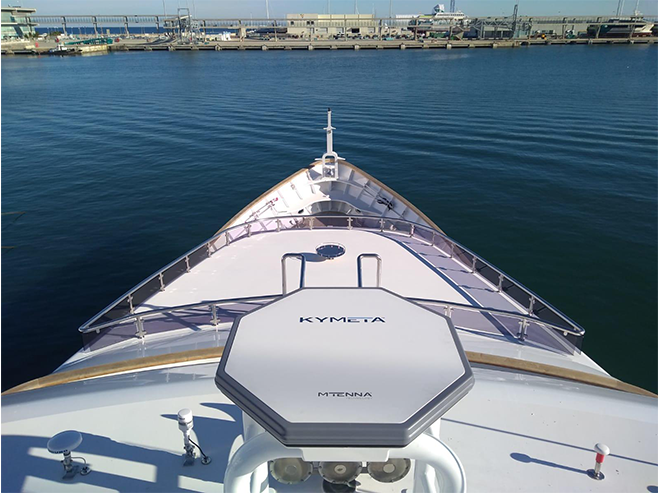 I would definitely recommend a Kymeta solution to other clients, as they meet the needs of captain, ETO and owner. Flat panel antennas are certainly the future and so why would I want to specify anything less? E Yachts look forward to working with e3 in the near future and installing many more Kymeta panels.